A fundamental question in the field of epigenetics is how the epigenetic marks are transmitted through the cell cycle. Chromatin is the carrier of genetic information, and is divided into two distinct domains: euchromatin and heterochromatin. Euchromatin is loosely packed, stretched and transcriptionally active, whereas heterochromatin contains highly condensed DNA and inactive transcription. Histone hypoacetylation and the histone H3 lysine 9 (H3K9) methylation are conserved epigenetic hallmarks of heterochromatin. When DNA replicates, the tightly packed heterochromatin is disrupted ahead of the replication fork, and chromatin structure and epigenetic information are restored behind the fork. How these processes are regulated during replication remains unclear. LI Fei’s group in New York University has identified several key proteins involved in the regulation of heterochromatin inheritance by using a combination of multiple approaches. These proteins include Cdc20/Pol2, Dpb2, Dpb3 and Dpb4. DNA polymerase (Pol) epsilon catalytic subunit, Cdc20/Po12, plays a key role in the inheritance of H3K9 methylation. Further genetic studies revealed that both Dpb3 and Dpb4 play essential roles in the restoration of heterochromatin assembly. 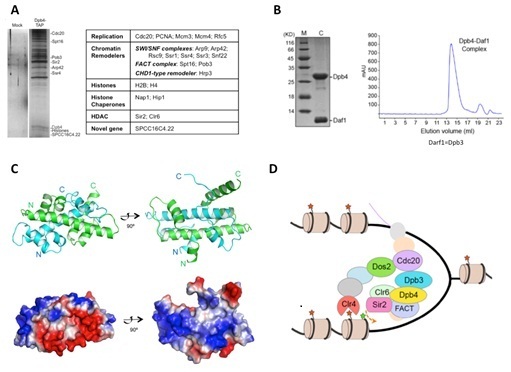 As a collaboration effort, Dr. CHEN Yuhang’s group from the Institute of Genetics and Developmental Biology, Chinese Academy of Sciences (CAS), expressed, assembled and purified the Dbp-3-Dbp4 complex, and further solved the their high resolution structure at 1.9 Å. The structure revealed both Dpb3 and Dpb4 has a histone fold motif, and they form the H2A-H2B like dimer. Mutational studies revealed that Dpb3–Dpb4 dimer is essential for heterochromatin silencing. Further biochemical assay indicated the Dpb3-Dpb4 complex interact with histones and recruits other silencing factors to mediate histone modifications. This study establishes a previously unrecognized link between histone deacetylation and H3K9 methylation, and provides mechanistic insights into h how the Dpb3-Dpb4 complex is involved in chromatin regulation during replication. The work entitled “Coordinated regulation of heterochromatin inheritance by Dpb3-Dpb4 complex” was published in PNAS on November 6, 2017(www.pnas.org/cgi/doi/10.1073/pnas.1712961114). This work was supported by the National Key R&D Program of China (2016YFA0500503), CAS Strategic Priority Research Program (XDB08020301) and the National Natural Science Foundation of China grants (NSFC, 31470728 and 31728010).